Bleeding the RockShox Reverb Seat Post - we show you how it's done! The RockShox Reverb is considered one of the most reliable seat posts on the market. However, due to falls or improper installation, air may enter the hydraulic system and affect the function of the lowerable seat post. We'll show you how to bleed your Reverb and what you should consider when doint it. Be sure to use the correct hydraulic oil from RockShox. Incorrect use of other mineral oils or brake fluid can cause your seat post to be damaged. Pay attention to cleanliness when bleeding. Dirt in the hydraulic system of your line can permanently damage your seat post. We recommend using an original RockShox bleeding kit. This is the only way to guarantee a properly sealed system when bleeding and that there's no more air left in the pipe after bleeding. You have read that? Then we can now start with the bleeding! Bring the trigger or remote control of your RockShox Reverb into a horizontal position. Place the speed adjuster against the direction of the arrow until it stops. 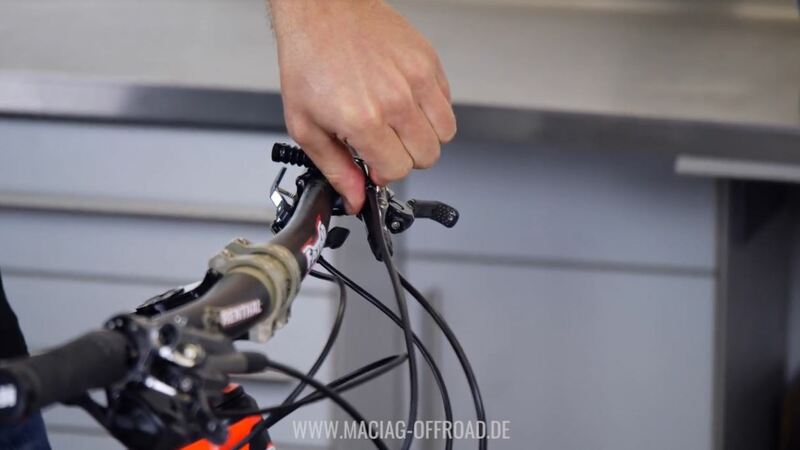 Loosen the saddle clamp and remove the seat post from the seat tube. Tip: You can attach the seat post to your rear wheel with a cable tie. This will help you afterwards with the bleeding. Fill your bleeding injector with mineral oil. Tip: Allow the injectors to rest for a few minutes before bleeding to allow the oil to degas. Remove the bleed plug on the remote control and unscrew the "receiving injector" (Attention: carefully!). 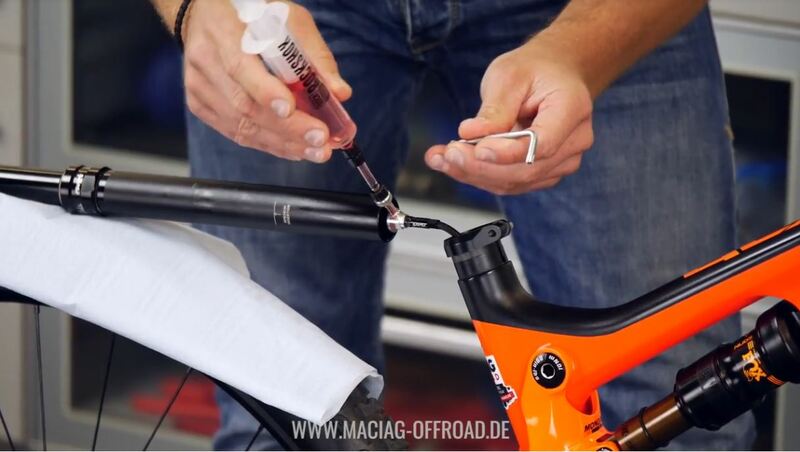 Remove the bleed plug on the bottom of the seat post and unscrew the "giving injector". Now press the oil from the giving injector into the receiving injector and back by turns. Repeat the process a few times until there's no more air in the pipe. Attention: Never press all the liquid from an injector into the system. This way, air would enter the system again. Remove the giving injector from the seat post and lock the bleed plug with the correct torque. Remove the seat post from the tire and secure it to the specified torque in the seat pipe. Bleed the remote control by pressing the trigger and the injector several times at the same time. Remove the injector from the remote control and lock the bleed screw to the correct torque. Clean all components with brake cleaner and make sure that no oil has dripped on your brake pads when bleeding. Turn the speed adjuster back to its usual position. Now you can check your Reverb seat post for function. 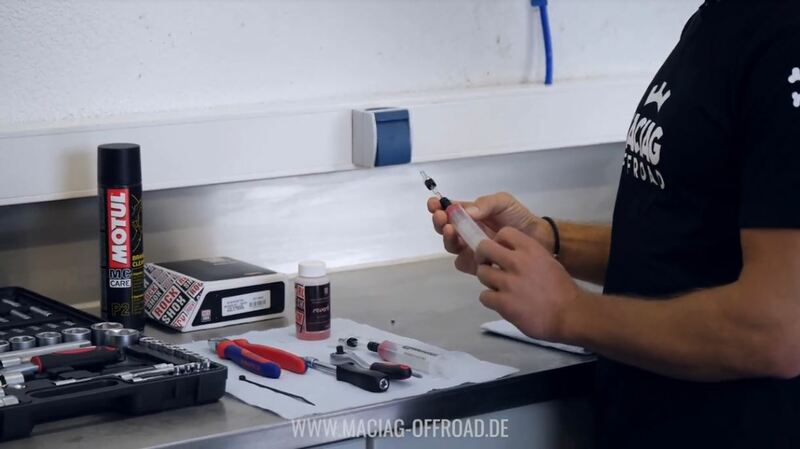 If there are still problems, repeat the bleeding process again or seek professional help from the mountain bike mechanic you trust. If you liked this tutorial, feel free to leave a like and subscribe to our YouTube channel, where we regularly upload videos with English subtitles. This way, you will receive valuable tips from the MX & MTB world on a regular basis. All that remains to say is: Ride on!